Gold Coast Australia Accommodation, Attractions & More! The Gold Coast is Australia's holiday capital, home to a fantastic range of attractions, beautiful beaches, shopping, dining, major events and more! Browse through GoldCoastAustralia.com for a stack of information on where to stay and how to play. 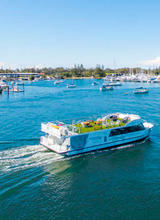 Search availability and book accommodation online, view our list of things to do on the Gold Coast (including some great FREE things to do), book tours, theme park tickets and attractions, read through our destination guides and find handy info like weather and public transport information to help you make your way around during your stay. When you’ve just come off a long flight the last thing you want is a long hotel transfer. Fortunately there is a great deal of accommodation only a short drive away from the Gold Coast Airport. Coolangatta is also known for it's great surf, excellent dining, as well as some of the Gold Coast's biggest events including Cooly Rocks On and the Quicksilver Pro. The original & still the best. Surfers Paradise is home to iconic accommodation Q1, the brand new Hilton Hotel, Marriott Resort & Spa and more apartment buildings and accommodation providers than any other city on the Gold Coast. With this much choice you're bound to find a place in Surfers to suit your holiday needs. A paradise for surfers and families, Burleigh Heads has one of the most amazing national parks and beaches in the country right on the headland, enjoy brilliant bushwalks and lots of holiday bargains, not to mention some great exclusive restaurants and fun cafes. Burleigh is where you will find some of the best fish'n'chips on the Gold Coast! World Heritage-listed mountain rainforests less than an hours drive from the beach. Marvel at ancient forests, magnificent views and waterfalls, and play in the clouds in what they call 'the green behind the gold'. With an array of accommodation options, from bed and breakfasts and villas to tree houses and castles, you'll forget the busy city and ocean is only a short drive away. The boutique hub of Gold Coast glamour, Main Beach has five star accommodation galore, all within close proximity to the Marina Mirage premier shopping and dining precinct, Sea World, and luxurious restaurants & boutiques on Teddar Avenue. Stay at Palazzo Versace, Sheraton Mirage or Sea World Resort, or if you're on a budget, try a beachside motel or hostel.